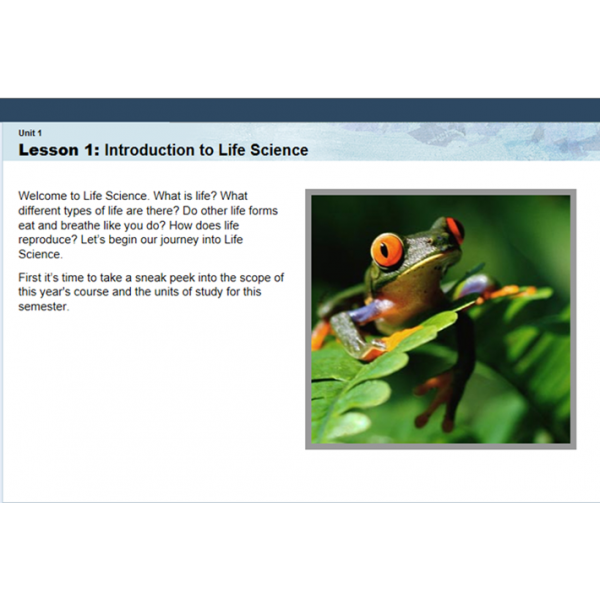 This Life Science course invites students to investigate the world of living things by reading, observing, and experimenting with aspects of life on earth. Students explore an amazing variety of organisms, the complex workings of the cell, the relationship between living things and their environments, and discoveries in the world of modern genetics. Practical, hands-on lesson activities help students discover how scientists investigate the living world. This Life Science course invites students to investigate the world of living things--at levels both large and small--by reading, observing, and experimenting with aspects of life on earth. Students explore an amazing variety of organisms, the complex workings of the cell, the relationship between living things and their environments, and discoveries in the world of modern genetics. Practical, hands-on lesson activities help students discover how scientists investigate the living world. Students perform laboratory activities and a full unit investigation to learn about the application of scientific methods. From giant redwoods to tiny algae, and from lumbering elephants to "no-see-em" gnats, the diversity of life on earth delights, startles, and amazes. But all living things share some common characteristics. What are the characteristics of life? What is the chemical basis for life? What molecules support life? In this course you'll explore these questions and more. They're everywhere, and they control our lives. What are they? Alien invaders? No. They are cells. They are inside us and all around us, in every living thing on earth. They are constantly growing, reproducing, communicating, and using energy. They sense, respond, and adapt to their environment. You've probably never thought much about cells, but there's much to discover about their intriguing lives. Organisms must meet many challenges to survive. The systems in multicellular organisms are like the different parts of a computer. Just as all the parts of a computer must function individually so that the computer will work, all the systems in an organism work together in a coordinated manner to keep the organism alive. What are these systems? How are they related? This unit will explore living systems and how they function. Look at everything in an aquarium. How do you think each of the organisms in the aquarium survives? If you were to draw a diagram of the interactions that take place in an aquarium, you would see a complex series of relationships. In the living world, no organism can survive by itself. Living things depend on other organisms and their environment to supply them with their needs. Every organism lives in a particular type of environment. In this unit, we will explore how populations change over time to survive in their environments, and what happens when the environment changes. Individuals that reproduce sexually have many characteristics that make them different from each other. In this unit, you will learn about the mechanisms responsible for these differences. Galaxies teeming with stars. Mysterious black holes. Exploding supernovas. The far reaches of the universe are filled with wonders. Right here on our own planet, however, is perhaps the greatest wonder of all: life. Scientists currently know of no other place in the universe where life exists. This unit explores scientists, ideas about how life originated on earth and how it has changed over its long history.